In memory of Ray Black, a W.W.II American Recon. veteran who met my Jeep at Point Lookout State Park in Maryland. Ray and his wife, Mary, were camp hosts there. They were a fun and hospitable couple. The first time I delivered mail in the Jeep Ray recognized the sound of the muffler from a few camp loops away. He would never ride in the Jeep, but would just stand staring at it with his hand on the hood. Rest in Peace Ray. The story of the Jeep is not just a simple story of the military producing an amazingly useful lightweight vehicle. This story begins with companies down on their luck, late nights, long drives, and the production by one small company of a battle ready prototype in 49 days. 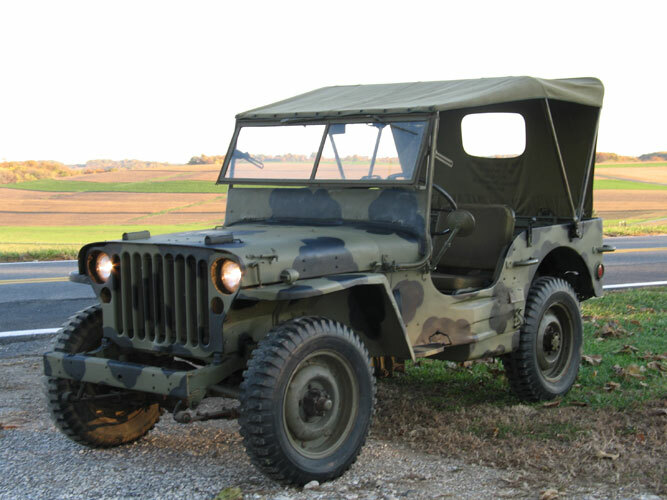 The beginnings of the Jeep that developed during World War Two were with a small company called the American Bantam Car Company. As Germany began to roll across Europe the Bantam company hired a lobbyist to push Army brass to accept a small vehicle for military use. According to varying sources between May and June of 1940 the military came up with a set of characteristics desired in a light reconnaissance vehicle. Bantam then set to work thinking about how to design a vehicle to match the requirements. In a surprise move the Army Quartermaster Corps then put out a bid request on July 11th to over 134 companies. Bantam pulled some strings and managed to bring in designer Karl Probst who put together a blueprint for the bid by July 22. Willys Overland was the only other company to put a bid in on the 22nd. 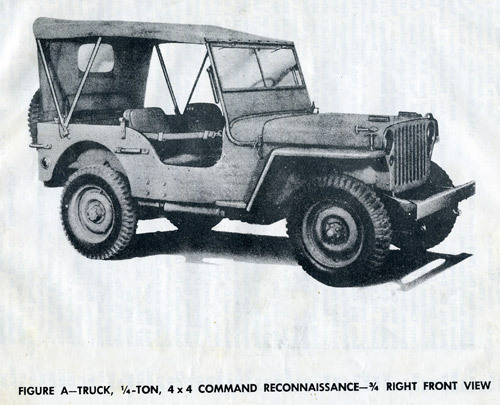 The Willys' bid consisted of rough designs, and a request for more time to build a prototype. On the other hand Bantam's design was ready to go and they were willing to meet the delivery date for the prototype. Bantam was awarded the initial contract. By September 22nd 1940 Bantam had produced a reliable prototype using many off-the-shelf parts from their manufacturing facility as well as other companies. This was driven to the Camp Holabird testing grounds in Maryland by Mr. Probst and the plant manager, they arrived a half hour before deadline. The Bantam Jeep tested extremely well. Bantam went on to produce another 69 prototypes. Willys and Ford representatives watched and took notes on the testing though and then went back home to build their own vehicles. Willys and Ford would return later with their prototypes and Willys' vehicle would turn out as the favorite of the three. Bantam would only end up producing about 2,600 of their BRC-40's . Bantam would then be shuffled off to produce trailers and other items as the military brass believed that Bantam could not produce the amount of vehicles they needed. It would be easy to continue on from here into where the Jeeps served, how they were used and who used them, but there are many good books on the subject. There are many useful web sites as well. Suffice to say that these vehicles which were never expected to last too long proved far more durable than anyone imagined, and became a real mascot, friend, and savior to Allied troops in World War Two. The Jeep is the vehicle in our collection which has been with me the longest. It has stayed with me through antique Chevy trucks, Corvairs, Triumphs and musclecars. The Jeep has been our steady, reliable rock. There is an old Russian tale about Rock Soup. A man asks if he can borrow water to make a soup which he will flavor with a rock. Then he asks for a carrot, some other vegetables etc.. until he eventually has an amazing stew. Our Jeep is a similar story. It can probably be said that our Jeep landed at both Anzio and Normandy. Unlike many pedigreed Jeeps our 1944 Willys MB was part of a focused (and some might think insane) collecting effort by one individual who bought a CJ 2A and then decided he wanted a W.W.II Jeep. The first thing you may think is that this vehicle is a repro tub on top of a CJ frame, but that is not the case. What you see is a collection of original (many n.o.s.) 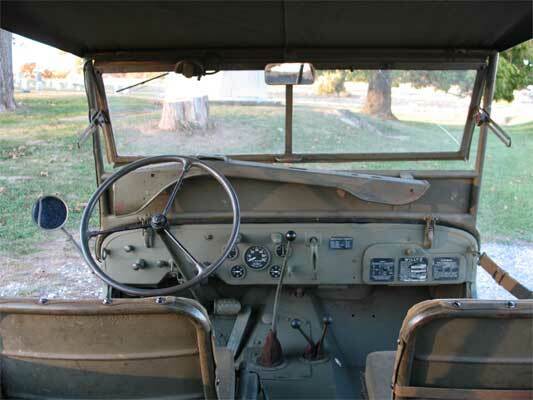 and some reproduction parts gathered together to create a highly authentic Jeep restoration. The parts gathering began in the early 1980's when our friend, Scott Roberts, brought home a CJ 2A. The vehicle was deemed too rusty to be restorable so he set out to gather the parts for a WWII Jeep. By the late 1980's the Jeep had come together and was being used regularly in military reenactments as well as airshow and other living history displays. 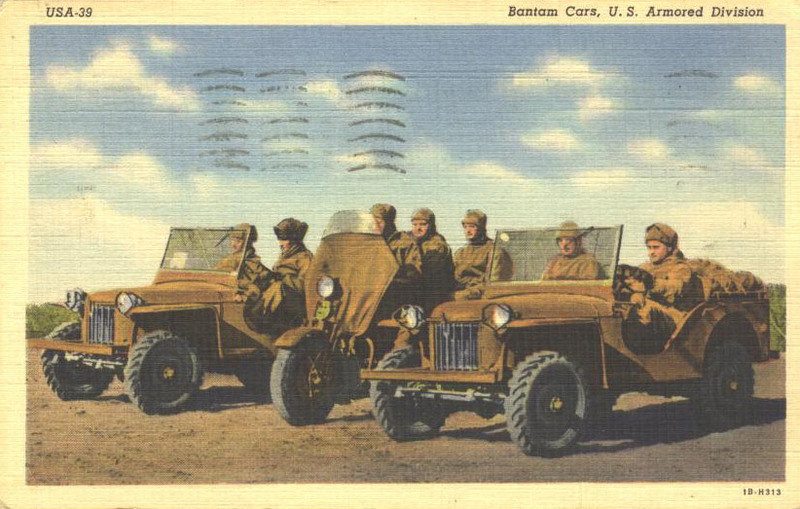 The Jeep has traveled in many guises varying from 4th Armored to S.A.S. and others. Amongst its many experiences in the last twenty years it has developed an affinity for water. Its first experience with the ocean won it a purple heart trophy. 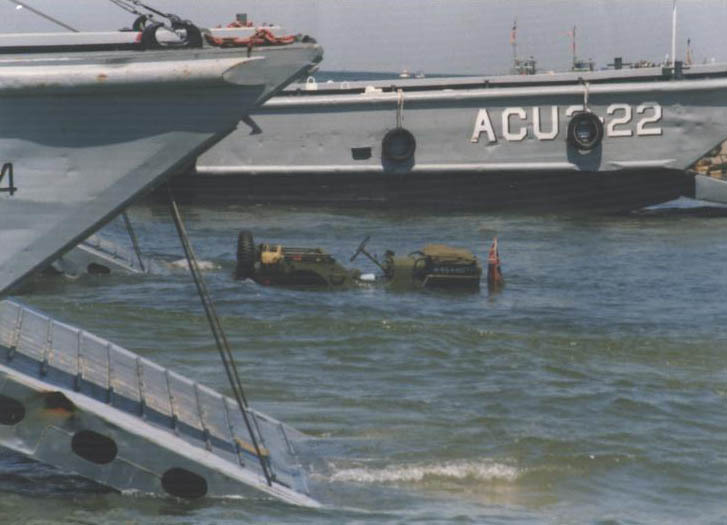 At the D-Day 50th anniversary in Virginia Beach the poor Jeep went off the end of an LST and nosed into water which swamped its distributor. Frustratingly the water was not too deep to drive through, but the Jeep stalled out and sat. It was rescued late in the day by a reenactor with a weapons carrier. By the mid 1990's Scott was my neighbor in Southern Maryland and the Jeep lived behind his house. I occasionally drove it to the State Park I worked at. It was popular with the visitors and with a Mr. Ray Black who drove one in W.W. II. I used the Jeep for a couple of displays and for mail delivery but eventually we parted ways as I moved up to Baltimore. A couple years later I was prowling for a Jeep and called Scott to see if he could recommend any for sale. Within a week he called back with a generous offer to purchase his baby. He delivered it within a couple of months. The Jeep arrived stacked deep in parts and other military bits. I used the Jeep for reenacting 1st S.A.S., then Airborne Recce, and finally 1st Canadian Parachute Battalion. This Jeep was rebuilt to be used so it has become a familiar site to many reenactors. At airshows and reenactments I constantly run into people who remember getting a lift in the Jeep at some point or another. I even ran into the fellow who pulled it out of the water when it sank at Virginia Beach. Not only has the Jeep served as a reenacting vehicle, it also goes to car shows, and is driven on a regular basis. When the blizzard of February 2003 hit Baltimore Maryland, my Jeep was one of the only vehicles out on the roads. I helped drive volunteers down town to dig out a historic tug boat, and unfortunately got a close up view of the Baltimore and Ohio Railroad Museum roundhouse after it collapsed. All of this use of course took its toll, and by spring of 2005 the Jeep developed numerous rust holes, rust through in channel support sections, and mechanical issues. When the Jeep would not make it up a hill behind my house with three people on board Scott suggested that we tear it down and rebuild it. The summer of 2005 saw some high stress as my baby was broken down into many pieces. 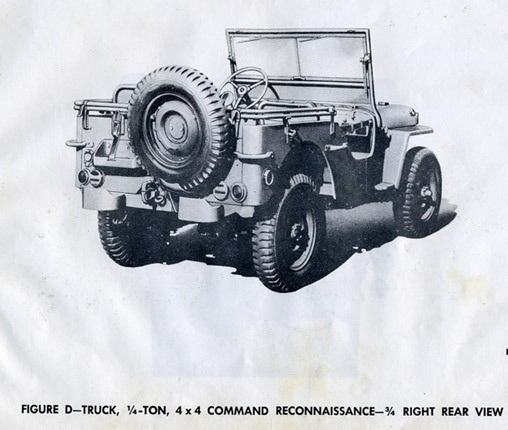 We primarily ordered parts from George Baxter of Army Jeep Parts. Scott has an amazing memory for how a Jeep goes together and operates, so he tore it down and got into the transfer case and transmission. I cut the rust out of the body with the help of my friend, Bill Max in Virginia. Bill and I took the body to a fellow he knows. This fellow graciously set aside his many other projects and repaired all the rust holes on the Jeep body using replacement pieces, and metal parts he fabricated. We had to replace one fender as it was too badly rusted, but Scott dug up a solid original at Army Jeep Parts. With the tub restored and the mechanics rebuilt we slowly moved towards putting the Jeep together. I spent many evenings sanding and prepping the tub and fenders. Labor Day weekend 2005 Scott and his very patient significent other came down to our home. Scott and I spent the weekend painting, assembling and more. By the end of the weekend we had the Jeep in one piece, and within a month it was running again. It was a joyous moment when I was once again able to take the Jeep for a ride through the countryside. 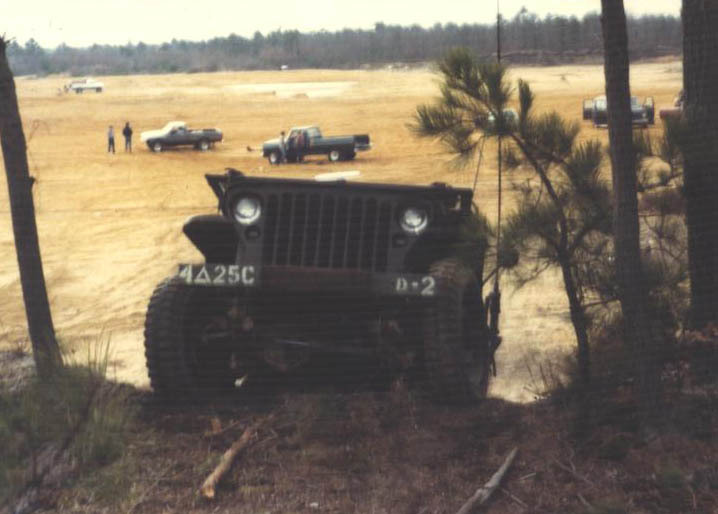 The photograph at the begining of this section (the Jeep by a field) was taken on my second run after the rebuild. Now the Jeep has all operational gears and feels strong as an ox. I cannot thank Scott enough for his time, persistence, and patience in bringing the Jeep back to its former glory. One thing Scott insisted on and I happily agreed with was repainting the Jeep in the British "Mickey Mouse" camouflage scheme. This scheme serves to break up the profile of the vehicle. Part of why this Jeep is so recognizable to so many people as there are only a couple others stateside with this camouflage. The Jeep also sports other typical British modifications like the marker lights being mounted on the fenders. Camouflage on military vehicles was more prevalent in WWII than most enthusiasts and self declared "experten" realize. Take a look at enough photographs and you will even find pictures of camouflaged American Jeeps. Recently, after being informed that there were no Mickey Mouse Jeeps at D-Day, I found a photo in the book "Quarter Ton" of Monty inspecting a camoflauged Jeep being loaded into a glider prior to D-Day. I find that sweeping historic generalizations cannot be applied to military vehicles, especially British ones. Since 2005 the Jeep has participated in many reenactments and convoys. Notably in 2007 and again in 2008 the Jeep drove in the WWII vehicle convoy from Thurmont, MD to Eisenhower's Farm in Gettysburg, PA. Each time it performed without any issues. In October of 2007 I showed the Jeep at the first annual Mason Dixon Willys Jeep Gathering hosted by Mike Hardesty of Jeepchasm.com Photos of the Jeep then appeared in the May/June 2008 issue of Low-Range magazine. 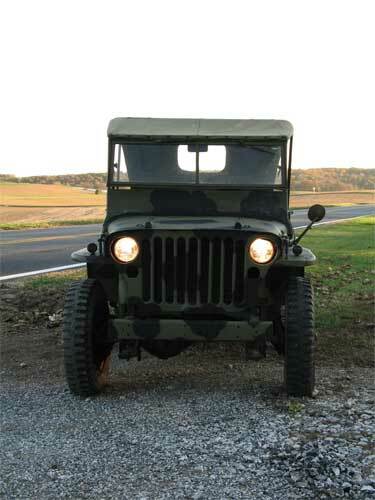 At the October 2008 Mason Dixon Willys gathering the Jeep took first place in the military Jeeps category. Trusty, a bit battered, but definately well loved and used, the Jeep captured enough hearts to win. Onward and upwards to more Jeep adventures! Homepage for the Military Vehicle Preservation Association. Go to links for 1/4 ton vehicles and you will find many good Jeep pages. 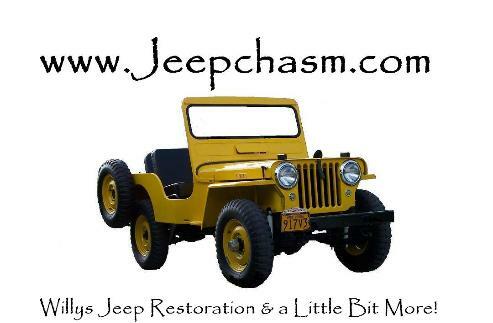 Jeep chasm, a fun website about mainly civilian Jeeps. This is George Baxter's company. We purchased most of the parts for the second restoration from him. He is a very knowledgeable source. Peter Debella's Jeep parts. I have dealt with him while restoring a friend's Jeep. He runs a good business and knows his Jeeps. Beachwood Canvas Works carries canvas parts as well as other parts for Jeeps and assorted Military Vehicles. These are great people to deal with. I have much of their canvas on my Jeep and have been happy with how it was worn over the years. This company makes parts here in the U.S. I ordered my hat channels from them (these are the support channels under the body) I recommend these channels over the Philippine ones which you will find most companies refusing to carry nowadays. The parts arrived quickly and were well made.